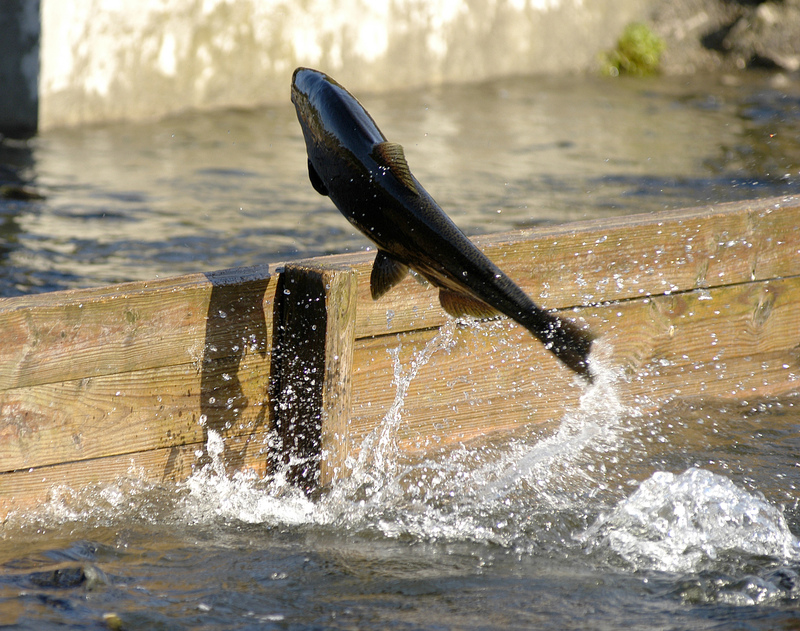 Grand Rapids, Mich. — Fall salmon egg-take efforts have drawn to a close in Michigan, and state officials are reporting another successful year. But coho and chinook salmon runs were far smaller than average on two key waters, the Platte and Little Manistee rivers, where most of the eggs are sought. “We got the egg-take done without a hitch, but saw just under 3,000 chinooks, our lowest number of chinooks ever,” said Scott Heintzelman, the fisheries technician supervisor who oversees the Michigan DNR chinook salmon egg-take on the Little Manistee River. “Our 40-year average (for the run) is almost 12,000 fish. Salmon eggs are the foundation for Michigan’s salmon-stocking program. Collected each fall when the fish run upstream to spawn and die, they are fertilized and moved to hatcheries. The young fish that hatch are reared and released at various ports and along Lake Michigan tributaries. Aaron Switzer, who oversees the state’s coho egg-take at the Platte River State Fish Hatchery, said 10,000 cohos were passed and collected this fall. That’s more than enough to reach the 5-million-egg quota (about 5,000 fish), but far fewer than the 30,000-fish runs that were seen in 2012 and 2013, or the 8,000- to 12,000-fish runs from 2008 to 2011. Michigan stocks about 1.57 million cohos in Lake Michigan each year and 559,000 chinooks. The latter is just a portion of the 1.6 million chinooks stocked lake-wide by all the surrounding states. Just why runs were lackluster is a matter of speculation. This year’s chinook run should have been mostly salmon born in 2011, according to Heintzelman. But, those fish were missing. That was the year researchers noted a marked decline in alewife abundance and predicted the 2014 run could be weak. Coho runs have other challenges, according to Switzer. They are not picky eaters, unlike chinook salmon, which feed mostly on alewives. Cohos are more opportunistic; they will eat alewives and other fish species. “We’re not missing a year-class of cohos,” Switzer said. “There are a lot of other factors (that affect coho survival). From the hatchery to the lake, they have to run a gauntlet. There are walleyes in the shallows and everyone knows to troll body baits on Platte Lake in the spring where the walleyes are there waiting. I swear they know the coho are coming. Then, once they are in Platte Bay, there are brown trout and steelhead. And once they get to the drop-off, lake trout are waiting. This entry was posted in Uncategorized and tagged DNR, Fishing, Great Lakes, Lake Michigan, Michigan Department of Natural Resources, Salmon. Bookmark the permalink.